Simon Kläntschi (Landmine Survivors Network Vietnam (LSN-V): Simon holds a Bachelor’s degree in International Relations from the University of Geneva. Following his graduation, he interned at the Swiss Embassy in Bangkok and volunteered in a home for disabled children in Cuzco, Peru, where his tasks included teaching and physical therapy. Simon then worked in Berlin for the Ecumenical Network for Central Africa, a network of five German Christian humanitarian organizations which advocates for human rights and development in the Great Lakes Region. At the time of his fellowship, Simon was pursuing a dual Master’s degree in International Affairs at Sciences Po Paris and the University of St. Gallen in Switzerland, specializing in International Security. Luong Thanh Hoai has been an outreach worker for AEPD (formerly LSN-V) since 2006. Himself physically disabled, he has helped many other disabled people by peer support. During this summer we have become close friends, even if we don’t speak the same language. We have been working together and spent many evenings playing Co Tuong (Chinese Chess), joking and drinking coffee. His 16-year-old daughter Ha My accompanied us every time and helped us to translate. One evening, when we were sitting as usual in a coffee shop and heavy drops announcing the coming rainy season were pattering on the bamboo roof, he told me his life story. Hoai grew up in a wealthy family in Va Hoa in the North of Quang Binh Province with his three brothers and two sisters. He was very smart and did well at school. And handsome how he was, the girls of his age admired him and fell in love – he told me with an impish, heartily smile. At the age of 18, he aimed to go to university and study law, to follow the example of his father, a judge at a criminal court. Hoai received an invitation letter to present himself to the university entry exams in Da Nang. Upon arrival, he was not allowed to take the exam. He was told, that he had to write the exam in Ho Chi Minh City. But it was to late to get there in time and he missed it. The university administration had sent him a wrong notification. This mistake, which was not his, changed his life irrevocably. Instead of a career as a lawyer, his strict father decided that Hoai should join the army, to learn the values of discipline and obedience. In 1988, after two years in the Vietnamese Navy, at the age of 20, he was badly injured in a missile attack during the Truong Sa Sea battle. 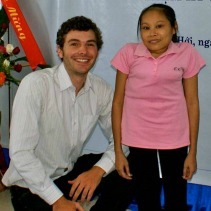 Hoai lost his left hand, and his right eye. It was replaced by a glass eye. The explosion also left him with scars on his face and chest. He spent 3 months in military hospitals in Na Trang and Hanoi, before he recovered from his injuries and could go back to his hometown. “First my neighbors and friends didn’t recognize me. When they realized that it was me, they cried and felt deep sympathy for my hard destiny. In the first years, I was very sad and felt pity for myself. The horrible moments I had experienced during the attack haunted me. But it was thanks to my good friends and family that I recovered mentally and grew strong again. I knew I could live with the disability and start a new life”. In 1993 he got married to a teacher of literature, and became father of a son and a daugther. After many years living out of a military penison, Hoai started an administration job at the Quang Binh University where he worked between 1999 and 2003. Then, three years later, he joined LSN-V, as a strong, highly intelligent and confident man, who knew where he stood. His life would have been so different if he had gone to university, instead of joining the army, Hoai told me. But sometimes a tiny little detail can change our lives forever… Proud father of two healthy and beautiful children, winner of two silver medals in discus and javelin at the 2007 Vietnamese ParaGames, brilliant chess player and patient teacher. And a dedicated outreach worker who loves his job. In his opinion, to make the assistance and consultancy meaningful and effective, the outreach workers have to understand the real needs of the beneficiaries and propose specific ways to help them.For Hoai, an outreach worker should be like a mirror, a good example for others to follow. He try to give his best every day. I am very happy for having met Hoai and I would like to thank him very much for everything he has shared with me. His will and strength, but also his cheering smile are simply inspiring. So great because u have good relationship with outreach workers at former LSNV. They are valuable sources for community work.